Q: How is Beef Bowl prepared and cooked? A: Every portion of beef is prepared and cooked through 22 procedural steps. The beef is sliced at the food processing center and cooked in the store. 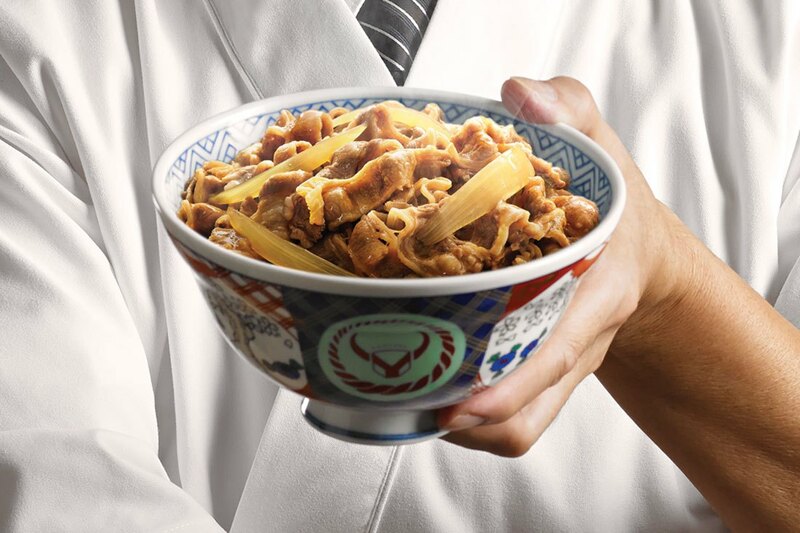 Every Beef Bowl is made wholeheartedly. Q: Why is the beef so tasty? A: Mainly produced from quality farms in the United States, our grain-fed beef are fed by premium corns and wheat, with a perfect amount and distribution of marbling, tender and delicious. Q: Why is the onion of Beef Bowl so sweet and fragrant? A: We have assigned our staff to inspect the quality of onions regularly and use Brix spindle to measure sugar degree, so as to be sure that customers enjoy fresh and sweet onions. Q: Why is Teriyaki Chicken so crispy? A: We carefully select chicken which falls within the size requirement and pan fry it at high temperature of 220℃, making the chicken tender and crispy. Q: Why is Milk Tea creamy and full bodied? A: Our evaporated milk is produced in Netherlands, creamy and full bodied, leaving you an unforgettable flavor.